For the baseball pitcher, see Kenny Rogers (baseball). Kenneth Ray Rogers (born August 21, 1938) is an American singer, songwriter, actor, record producer, and entrepreneur. He is a member of the Country Music Hall of Fame. Though he has been most successful with country audiences, Rogers has charted more than 120 hit singles across various music genres, topped the country and pop album charts for more than 200 individual weeks in the United States alone, and has sold over 100 million records worldwide, making him one of the best-selling music artists of all time. On September 25, 2015, Rogers announced on NBC's Today Show that he was retiring from show business after a final tour to spend more time with his wife and twin boys. Two of his albums, The Gambler and Kenny, are featured in the About.com poll of "The 200 Most Influential Country Albums Ever". He was voted the "Favorite Singer of All Time" in a 1986 joint poll by readers of both USA Today and People. He has received numerous awards such as the AMAs, Grammys, ACMs and CMAs, as well as a lifetime achievement award for a career spanning six decades in 2003. Later success includes the 2006 album release, Water & Bridges, an across the board hit, that hit the Top 5 in the Billboard Country Albums sales charts, also charting in the Top 15 of the Billboard 200. The first single from the album, "I Can't Unlove You", was also a sizable chart hit. Remaining a popular entertainer around the world, the following year he completed a tour of the United Kingdom and Ireland, telling BBC Radio 2 DJ Steve Wright his favorite hit was "The Gambler". He has also acted in a variety of movies and television shows, most notably the title roles in Kenny Rogers as The Gambler and the MacShayne series as well as his appearance on The Muppet Show. He is also a co-founder of the restaurant chain Kenny Rogers Roasters in collaboration with former Kentucky Fried Chicken CEO John Y. Brown Jr. .
Rogers was born the fourth of eight children on August 21, 1938, in Houston, Texas. His parents were Lucille Lois (née Hester; 1910–1991), a nurse's assistant, and Edward Floyd Rogers (1904–1975), a carpenter. Rogers is of Irish and Native American ancestry. Rogers attended Wharton Elementary School. At his estate in Colbert, Georgia, Rogers keeps a pet goat named Smitty, having originally acquired the animal from a friend in 2008. According to Rogers, the goat has been "(his) center", providing a calming influence after long and stressful touring schedules. Kenny Rogers has been married five times, and he is presently married to Wanda Miller since 1997, together they have two children. He has five children in total. In a recording career dating back to the 1950s, Rogers moved from teenage rock'n'roll through psychedelic rock to become a country-pop crossover artist of the 1970s and 1980s. He had a minor solo hit in 1957 called "That Crazy Feeling". After sales slowed down, Rogers joined a jazz group called The Bobby Doyle Three, who got a lot of work in clubs thanks to a reasonable fan following. The group recorded for Columbia Records. They disbanded in 1965, and a 1966 jazzy rock single Rogers recorded for Mercury Records, called "Here's That Rainy Day", failed. Rogers also worked as a producer, writer and session musician for other performers, including country artists Mickey Gilley and Eddy Arnold. In 1966 he joined the New Christy Minstrels as a singer and double bass player. Feeling that the Minstrels were not offering the success they wanted, Rogers and fellow members Mike Settle, Terry Williams, and Thelma Camacho left the group. They formed The First Edition in 1967 (later renamed "Kenny Rogers and The First Edition"). They were later joined by Kin Vassy. They chalked up a string of hits on both the pop and country charts, including "Just Dropped In (To See What Condition My Condition Was In)", "But You Know I Love You", "Ruby, Don't Take Your Love to Town", "Tell It All, Brother", "Reuben James", and "Something's Burning". When the First Edition disbanded in 1976, Rogers launched his solo career. He soon developed a more middle-of-the-road sound that sold to both pop and country audiences. He has charted more than 60 top 40 hit singles (including two number ones—"Lady" and "Islands in the Stream"). His music has also been featured in top-selling movie soundtracks, such as Convoy, Urban Cowboy, and The Big Lebowski. After leaving the First Edition in 1976, after almost a decade with the group, Rogers signed a solo deal with United Artists. Producer Larry Butler and Rogers began a partnership that would last four years. Rogers first outing for his new label was Love Lifted Me. The album charted and two singles, "Love Lifted Me" and "While the Feeling's Good", were minor hits. The song "Runaway Girl" was featured in the motion picture Trackdown. Later in 1976, Rogers issued his second album, the self-titled Kenny Rogers, whose first single, "Laura (What's He Got That I Ain't Got)", was another solo hit. The single "Lucille" (1977) was a major hit, reaching number one on the pop charts in 12 countries, selling over five million copies, and firmly establishing Rogers' post-First Edition career. On the strength of "Lucille", the album Kenny Rogers reached No. 1 in the Billboard Country Album Chart. More success was to follow, including the multi-platinum selling album The Gambler and another international Number 1 single, "Coward of the County", taken from the equally successful album, Kenny. In 1980, the Rogers/Butler partnership came to an end, though they would occasionally reunite: in 1987 on the album I Prefer the Moonlight and again in 1993 on the album If Only My Heart Had a Voice. In the late 1970s, Rogers teamed up with close friend and Country Music legend Dottie West for a series of albums and duets. Together the duo won 2 gold records (1 of which later went platinum), 2 CMA Awards, an ACM nomination, two Grammy nominations and 1 Music City News Award for their two hit albums "Every Time Two Fools Collide" (#1) and "Classics" (#3), selling out stadiums and arenas while on tour for several years, as well as appearing on several network television specials which showcased them. Their hits together "Every Time Two Fools Collide" (#1), "Anyone Who Isn't Me Tonight" (#2), "What Are We Doin' in Love" (#1), "All I Ever Need Is You" (#1) and "Till I Can Make It On My Own" (#3) all became Country standards. Of West, Rogers stated in a 1995 TNN interview: "She, more than anybody else I ever worked with, sang with such emotion that you actually believed what she sang. A lot of people sing words, Dottie West sang emotions." In a 1978 press release for their album "Every Time Two Fools Collide", Rogers credited West with further establishing and cementing his career with Country Music audiences. In the same release, West credited him with taking her career to new audiences. Rogers was with West only hours before she died at age 58 after sustaining injuries in a 1991 car accident, as discussed in his 2012 biography "Luck Or Something Like It". In 1995 he starred as himself, alongside Michele Lee as West, in the CBS biographical film Big Dreams and Broken Hearts: The Dottie West Story. In 1980, a selection he recorded as a duet with Kim Carnes, "Don't Fall In Love With A Dreamer", became a major hit. Earlier that year, he sang a duet of "You and Me" with Lynda Carter in her television music special Lynda Carter Special (Rogers originally recorded this with Dottie West for the Every Time Two Fools Collide album). Later in 1980 came his partnership with Lionel Richie who wrote and produced Rogers' No. 1 hit "Lady". Richie went on to produce Rogers's 1981 album Share Your Love, a chart topper and commercial favorite featuring hits such as "I Don't Need You" (Pop No. 3), "Through the Years" (Pop No. 13), and "Share Your Love with Me" (Pop No. 14). His first Christmas album was also released that same year. In 1982, Rogers released the album Love Will Turn You Around. The album's the title track reached No. 13 on the Billboard Hit 100 and topped the country and AC charts. It was the theme song of Rogers' 1982 film Six Pack. Shortly afterwards, he started working with producer David Foster in 1983 recording the smash Top 10 hit Bob Seger cover "We've Got Tonight", a duet with Sheena Easton. Also a #1 single on the Country charts in the United States, it reached the Top 30 on the British charts. In 1981, Rogers bought the old ABC Dunhill building and built one of the most popular and state-of-the-art recording studios in Los Angeles. The song "We Are The World" was recorded there. Rogers went on to work with Barry Gibb of the Bee Gees who produced his 1983 hit album Eyes That See in the Dark, featuring the title track and yet another No. 1 hit "Islands in the Stream", a duet with Dolly Parton. Gibb, along with his brothers, Robin and Maurice, originally wrote the song for Marvin Gaye in an R&B style, only later to change it for the Kenny Rogers album. The partnership with Gibb only lasted one album, which was not surprising considering that Rogers' original intention was to work with Gibb on only one song. Gibb insisted on doing the entire album together. "Islands in the Stream", Rogers' duet with Dolly Parton, was the first single to be released from Eyes That See in the Dark in the United States, and it quickly went to No. 1 in the Billboard Hot 100 (it would prove to be the last country single to reach No. 1 on that chart until "Amazed" by Lonestar did so in 2000), as well as topping Billboard's country and adult contemporary singles charts; it was certified Platinum by the Recording Industry Association of America for shipping two million copies in the United States. Rogers would reunite with Parton in 1984 for a holiday album, "Once Upon a Christmas" and TV special "Kenny & Dolly: A Christmas to Remember" (which resulted in a popular video of "Christmas Without You"), as well as a 1985 duet "Real Love", which also topped the U.S. country singles chart. The two would continue to collaborate on occasional projects through subsequent years, including a 2013 duet single "You Can't Make Old Friends". Despite the success of "Islands in the Stream", however, RCA Records insisted on releasing Eyes' title track as the first UK single, and the song stalled at a disappointing No. 61 there, although it did stay in the top 100 for several weeks. (When it was eventually released in the United States, it was more successful, charting high on the Adult Contemporary chart and making the country top 30.) "Islands in the Stream" was issued as a follow-up single in Britain and sold well, making No. 7. The album itself reached No. 1 on the country charts on both sides of the Atlantic and enjoyed multi-million sales. "Buried Treasure", "This Woman" and "Evening Star"/"Midsummer Nights" were also all successful singles from the album. Shortly after came the album What About Me?, a hit whose title track, a trio performance with James Ingram and Kim Carnes, was nominated for a Grammy Award; the single "Crazy" (not to be confused with the Willie Nelson-penned Patsy Cline hit) topped the country charts. David Foster was to work again with Rogers in his 1985 album The Heart of the Matter, although this time Foster was playing backing music rather than producing, a role given to George Martin. This album was another success, going to No. 1, with the title track making to the top ten category in the singles charts. The next few years saw Rogers scoring several top country hits on a regular basis, including "Twenty Years Ago", "Morning Desire", "Tomb of the Unknown Love", among others. On January 28, 1985, Rogers was one of the 45 artists who recorded the worldwide charity song "We Are the World" to support hunger victims in Africa. The following year he played at Giants Stadium. In 1988, Rogers won a Grammy Award for "Best Country Collaboration with Vocals" with Ronnie Milsap — "Make No Mistake, She's Mine". In the 1990s Rogers continued to chart with singles such as "The Factory" and "Crazy In Love", another selection that Kim Carnes provided him with, "If You Want To Find Love", and "The Greatest". His second Christmas album, titled Christmas in America, was released in 1989 for Reprise Records. From 1991–94, Rogers hosted The Real West on A&E, and on The History Channel since 1995 (Reruns only on The History Channel). He visited Miller's during this time period. From 1992–95, Rogers co-owned and headlined Branson, Missouri's 4,000 seat Grand Palace Theatre. In 1994, Rogers released his "dream" album titled Timepiece on Atlantic Records. It consisted of 1930s/1940s jazz standards, the type of music he had performed in his early days with The Bobby Doyle Three in Houston. In 1996, Rogers released an album Vote For Love where the public requested their favorite love songs and Rogers performed the songs. (Several of his own hits were in the final version.) The album was the first for the TV shopping channel QVC's record label, onQ Music. The album, sold exclusively by QVC, was a huge success and was later issued in stores under a variety of different titles. It reached No. 1 in the UK country charts under the title Love Songs (a title also used for various compilations) and also crossed over into the mainstream charts. In 1999, Rogers scored with the single "The Greatest", a song about life from a child's point of view (looked at through a baseball game). The song reached the top 40 of Billboard's Country singles chart and was a Country Music Television Number One video. It was on Rogers' album She Rides Wild Horses the following year (itself a top 10 success). In 1999, Rogers also produced a song, "We've Got It All", specifically for the series finale of the ABC show Home Improvement. Not found on any album, the recording sells for a high sum at auction. In the 21st century, Rogers was back at No. 1 for the first time in more than a decade with the 2000 single "Buy Me a Rose". In doing so, he broke a 26-year-old record held by Hank Snow (who, in April 1974, was aged 59 when he scored with "Hello Love"). Rogers held the record until 2003, when then 70-year-old Willie Nelson became the oldest artist to have a No. 1 on the country charts with his duet with Toby Keith, "Beer for My Horses". Although Rogers did not record new albums for a couple of years, he continued to have success in many countries with more greatest hits packages. In 2004 42 Ultimate Hits, which was the first hits collection to span his days with the First Edition to the present, reached Number 6 on the American country charts and went gold. It also featured two new songs, "My World Is Over" with Whitney Duncan and "We Are the Same". "My World Is Over" was released as a single and was a minor hit. In 2005 The Very Best of Kenny Rogers, a double album, sold well in Europe. It was the first new solo Kenny Rogers hits album to reach the United Kingdom for over a decade, despite many compilations there that were not true hits packages. Rogers also signed with Capitol Records and had more success with the TV advertised release 21 Number Ones in January 2006. Although this CD did contain 21 chart-toppers as the title claims (recorded between 1976 and the present day), this was not a complete collection of Rogers' No. 1 singles, omitting such singles as "Crazy in Love" and "What About Me?" Capitol followed 21 Number Ones with Rogers' new studio album, Water & Bridges, in March 2006 on the Capitol Nashville Records label. The first single from the album was "I Can't Unlove You", which peaked at No. 17 on the country charts, after spending over 6 months on the hit list, more than 50 years after he formed his first group and 38 years after his first major hit as leader of The First Edition; the song remains in recurrent airplay on some radio stations today. "I Can't Unlove You" was followed up with the second single from the album, "The Last Ten Years (Superman)", in September 2006. The third single, "Calling Me", which features Don Henley, became popular in early 2007, and was nominated for a Grammy Award at the 2007 Grammy Awards. Also in 2007, the 1977 Kenny Rogers album was re-issued as a double CD, also featuring the 1979 Kenny album and this once again put Rogers' name into the sales charts worldwide. The following year, another compilation album (A Love Song Collection) also charted. Rogers has recorded 65 albums and sold over 165 million records. On August 26, 2008, Rogers released 50 Years exclusively at Cracker Barrel stores. The album includes some of Rogers' greatest hits, plus 3 new songs. The release is designed to celebrate Rogers' 50th year in the music business. In 2007 the England national rugby union team adopted Rogers song "The Gambler" as their unofficial 2007 Rugby World Cup anthem, after hearing prop Matt Stevens playing it in the team hotel. Before the semi-final against France and the final against South Africa, Rogers sent video messages of support to the team in light of them choosing his song. He offered to come to England and party with the team if they won the World Cup. In 2008 Rogers toured with his Christmas Show. He split the show up, making the first half his "best of" and the second half his Christmas songs. In 2009 he toured the United Kingdom. In 2009, Rogers embarked on his 50th Anniversary Tour. The tour went around the United States, Britain and Ireland. On April 10, 2010, a TV special was taped, Kenny Rogers: The First 50 Years. Dolly Parton and Lionel Richie were among those set to perform with Rogers during a show celebrating his contribution to country, blues and pop music, It took place at the MGM Grand in Foxwoods. This special debuted on March 8, 2011 on Great American Country. On June 10, 2012, Rogers appeared on stage with the musical group Phish to perform his hit song "The Gambler" at the Bonnaroo Music and Arts Festival. Also in 2012, Rogers re-recorded the hit song "Lady", a duet with its songwriter Lionel Richie, on Richie's album Tuskegee. The pair also performed the song live at the 2012 ACM concert, "Lionel Richie & Friends". On April 10, 2013, the CMA announced that Rogers would be a 2013 inductee into the Country Music Hall of Fame, along with Cowboy Jack Clement and Bobby Bare. In June 2013 he performed at the Glastonbury Festival in the Sunday afternoon 'Legends' slot. In 2013, Rogers recorded a new album with the name You Can't Make Old Friends. This album included the title track, a new duet with Dolly Parton, which was his first single released in six years. In 2015, Rogers announced his farewell tour, titled The Gambler's Last Deal. He stated his intention to retire from touring at its completion, although he is[when?] considering the possibility of recording another studio album. In announcing the tour, Rogers indicated at the time that his final tour appearance would be on NBC's Today show. Concert dates were scheduled through 2018 and included visits to the United States, Australia, Scotland, Ireland, England, The Netherlands and Switzerland. On April 5, 2018, it was announced that Rogers canceled his remaining tour as advised by doctors due to a series of health challenges. Rogers' final concert in Nashville took place on October 25, 2017 at the Bridgestone Arena where he was joined by an array of guest artists including Linda Davis, Elle King, Little Big Town, Lionel Richie, Billy Currington, Lee Greenwood, The Flaming Lips, The Oak Ridge Boys, Justin Moore, Travis Tritt, The Judds, Kris Kristofferson, Alison Krauss, Chris Stapleton, Lady Antebellum, Idina Menzel, Crystal Gayle, Reba McEntire and Jamey Johnson. The concert also included a special appearance by long-time friend Dolly Parton, who performed "You Can't Make Old Friends" and "Islands in the Stream" with Rogers for the final time. His most successful final show was in Toledo, Ohio at the Huntington Center to a sold out audience. Rogers also had success as an actor. His 1982 movie Six Pack, in which he played a race-car driver, took more than $20 million at the United States box office, while made-for-TV movies such as The Gambler series, Christmas in America, and Coward of the County (based on hit songs of his) topped ratings lists. He also served as host & narrator for the A&E historical series The Real West. Rogers says that photography was once his obsession, before it morphed into a passion. He has authored the photo books Kenny Rogers' America (1986) and Your Friends and Mine (1987). As an entrepreneur, he collaborated with former Kentucky Fried Chicken CEO John Y. Brown Jr. in 1991 to start up the restaurant chain Kenny Rogers Roasters. The chicken and ribs chain, which is similar to Boston Market, was famously featured in an episode of the NBC sitcom Seinfeld called "The Chicken Roaster". On the November 27, 1997, broadcast of Late Night with Conan O'Brien, Rogers could not pick his chicken out in a taste test, claiming he preferred "greasy burgers". Season four of the TV series Fresh Off the Boat depicts the chain as owning a share of Louis Huang's Cattleman's Ranch restaurant and then filing for bankruptcy. Rogers is shown from the back but played by Jeff Pomerantz. Rogers and his restaurant were subjects of comedy from MADtv, especially the impersonation done by Will Sasso; the sketch of the faux-Rogers hosting Jackass became popular on the Internet. Rogers put his name to the Gambler Chassis Co., a Sprint car racing manufacturer started by C. K. Spurlock in Hendersonville, Tennessee. The company used the name from Rogers' hit song The Gambler. During the 1980s and 1990s, Gambler was one of the fastest and widely used Sprintcars with such drivers as Steve Kinser, Sammy Swindell and Doug Wolfgang driving the cars to victory in the World of Outlaws and the famous Knoxville Nationals. Gambler sprintcars were also successful in Australia with drivers such as Garry Rush and Steve Brazier using Gamblers to win multiple Australian Sprintcar Championships. Rush also used a Gambler chassis to win the UNOFFICIAL 1987 World Sprintcar Championship at the Claremont Speedway in Perth, Western Australia. Rogers appeared in a 2004 episode of Reno 911! as himself being subjected to incompetent security provided by starstruck sheriff's deputies to comical effect. In October 2012, Rogers released a book Luck or Something Like it: A Memoir about his ups and downs in his musical career. With Mike Blakely, he has written a novel, What Are the Chances, that was released September 1, 2013. In 2014, Rogers appeared as himself in a GEICO commercial, singing part of his song "The Gambler" a cappella while acting as the dealer in a card game. Although Rogers has used many session musicians to play instruments on his recordings, he has been backed on tours by the group Bloodline since 1976. The group originally started as a three piece. In The Journey (a 2006 documentary about his career) Rogers said he did not understand singers that changed their touring band every year, and that he sticks with Bloodline as they already "know the songs". 1994 Dr. Quinn, Medicine Woman Daniel Watkins Season 1, Episode: "Portraits"
2000 Touched by an Angel Denny Blye Season 6, Episode: "Buy Me a Rose"
2009 How I Met Your Mother Kindly Book Narrator (voice) Season 5, Episode: "Duel Citizenship"
1983 American Music Awards Favorite Country Single — "Love Will Turn You Around"
1981 American Music Awards Favorite Country Single — "Coward of the County"
1979 Music City News Country Single of the Year — "The Gambler"
1979 Grammy Awards Best Male Country Vocal Performance — "The Gambler"
1978 American Music Awards Favorite Single — "Lucille"
1977 Country Music Association Awards Single of the Year — "Lucille"
1977 Academy of Country Music Awards Single of the Year — "Lucille"
1977 Academy of Country Music Awards Song of the Year — "Lucille"
1977 Grammy Awards Best Male Country Vocal Performance — "Lucille"
^ a b c d CMT.com Staff (April 10, 2013). "Country Hall of Fame Elects Kenny Rogers, Bobby Bare, Jack Clement". CMT News. cmt.com. Retrieved April 13, 2013. ^ Coulter, Barry (June 9, 2014). "Kenny Rogers touches down in Cranbrook this week". Cranbrook Daily Townsman. Archived from the original on July 14, 2014. Retrieved June 11, 2014. ^ Gambler & Kenny are on About.com's poll of "The 200 Most Influential Country Albums Ever"
^ "Kenny Rogers". IMDb.com. Retrieved November 12, 2013. ^ ""The Muppet Show" Episode No. 4.10 (1979)". IMDb.com. Retrieved November 12, 2013. ^ Dalyhe, John. "Kenny Rogers takes his love to (Killarney) town". Irish Examiner. Retrieved February 11, 2017. ^ Rogers, Kenny. Luck or Something Like It: A Memoir. HarperCollins, October 2, 2012. ISBN 0062071602, 9780062071606. Google Books PT11 (See Google search page) - "I started grade school at Wharton Elementary School on West Gray Street with[...]"
^ Rogers, Kenny (2012). Luck or Something Like It: A Memoir. William Morrow Paperbacks. ISBN 0-0620-7161-0. ^ World Entertainment News Network (October 6, 2012). "Kenny Rogers Is Estranged From First Child". contactmusic.com. Retrieved April 7, 2017. ^ a b c Boylan, Connor (May 20, 2014). "Wedding hells!". The Sun. Retrieved April 7, 2017. ^ a b c Ollison, Rashod (December 5, 2016). "Kenny Rogers says farewell to the road". The Virginian-Pilot. Retrieved April 7, 2017. ^ a b Tunis, Walter (April 6, 2017). "After six decades, Kenny Rogers knows it's time to fold 'em". Retrieved April 7, 2017. ^ TheLimePopsicle (January 12, 2014). "Kenny Rogers - That Crazy Feeling (1957)" – via YouTube. ^ "The Big Lebowski: Original Motion Picture Soundtrack". Amazon. Retrieved May 9, 2012. ^ "Urban Cowboy: Original Motion Picture Soundtrack". Amazon. Retrieved May 9, 2012. ^ Bill Friskics-Warren (January 24, 2012). "Larry Butler, Producer for Kenny Rogers, Dies at 69". New York Times. Retrieved October 10, 2012. ^ Crumpler, David (January 26, 2017). "Kenny Rogers' final tour before retiring includes concert at Thrasher-Horne on Saturday". The Florida Times-Union. Retrieved April 7, 2017. ^ Inc, Nielsen Business Media (February 6, 1982). "Billboard". Nielsen Business Media, Inc. – via Google Books. ^ "Front Row King". Retrieved February 13, 2014. ^ Graff, Gary (December 1, 2016). "Kenny Rogers plans to fold 'em after final concert tour". Oakland Press. Retrieved April 7, 2017. ^ Malachowski, David (December 9, 2010). "Kenny Rogers plays Christmas music and his own hits". Times Union. Retrieved July 21, 2011. ^ Shedden, Iain (December 31, 2010). "Country's singalong king Kenny Rogers swings in". The Australian. Retrieved July 21, 2011. ^ "Kenny Rogers Q&A — Celebrates New Project with Old Classics. AOL Music Canada". Music.aol.ca. March 24, 2009. Retrieved July 21, 2011. ^ Britten, Nick (October 10, 2007). "The Telegraph". The Telegraph. Retrieved July 21, 2011. ^ "Mohegan Sun Casino". Newsroom.mohegansun.com. December 11, 2008. Retrieved July 21, 2011. ^ "Kenny Rogers: 'I figured, someone asked for me, so here I come'". Guardian. June 27, 2013. Retrieved June 27, 2013. ^ Wildsmith, Steve (March 1, 2017). "Country superstar Kenny Rogers goes all in for one last concert tour". The Daily Times. Retrieved March 19, 2017. ^ Hines, Ree (September 25, 2015). "Kenny Rogers reveals plan to retire after next tour: 'I've done this long enough'". Today.com. Retrieved March 19, 2017. ^ "Tour". KennyRogers.com. Retrieved March 19, 2017. ^ Savage, Mark (April 5, 2018). "Kenny Rogers cancels tour over health". BBC News. Retrieved April 6, 2018. ^ Cindy Watts. "Kenny Rogers, Dolly Parton drop the mic on his final performance". USA Today. 26 October 2017. Retrieved 5 December 2017. ^ "Chris Stapleton, Judds Reunion Added to Kenny Rogers Tribute Concert". 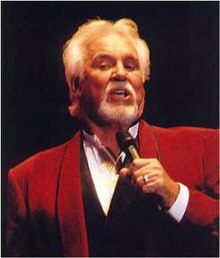 ^ Mario Tarradell, "Kenny Rogers is enthusiastic about his 50th anniversary special", The Dallas Morning News (July 16, 2010). ^ Ross, Joe (September 26, 2012). "Book Review: Luck or Something Like It by Kenny Rogers". Seattle Post-Intelligencer. ^ "[Article 60]The rise and fall of Kenny Rogers". Bill DeYoung.com. May 27, 2014. Archived from the original on May 27, 2014. Retrieved May 15, 2018. ^ "National Music Council". Musiccouncil.org. Retrieved July 21, 2011. ^ ; Written by Edward Morris (September 23, 2009). "CMT News". Cmt.com. Retrieved July 21, 2011. ^ "ASCAP". ASCAP. September 18, 2007. Retrieved July 21, 2011. Wikimedia Commons has media related to Kenny Rogers. Goldsmith, Thomas. (1998). "Kenny Rogers". In The Encyclopedia of Country Music. Paul Kingsbury, Editor. New York: Oxford University Press. pp. 455–6. "Today I Started Loving You Again"
This page was last edited on 7 April 2019, at 07:50 (UTC).